I am sure that there are people out there that would hear what I am about to say as fighting words but here goes: It’s hard to cook for two. 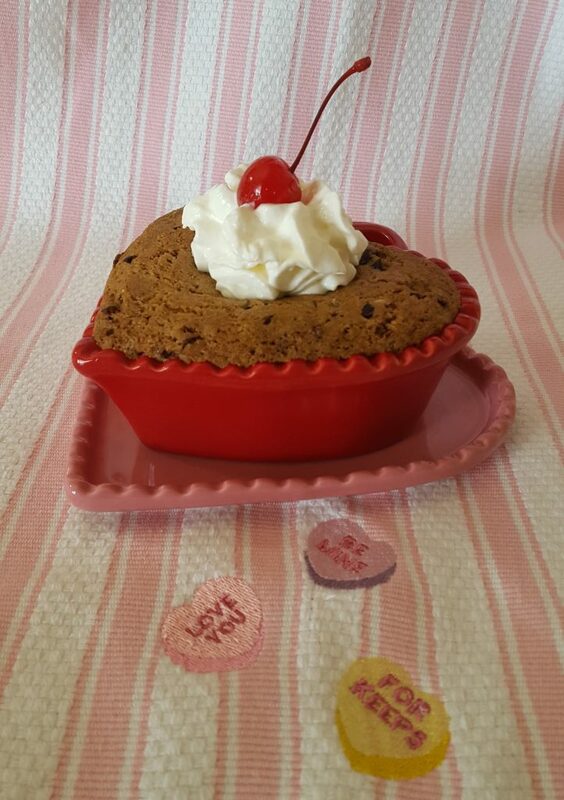 Hezzi-D posted a cookie for two that I decided would be perfect for Valentine’s Day for us. Here’s a healthy dessert for you and your +1. 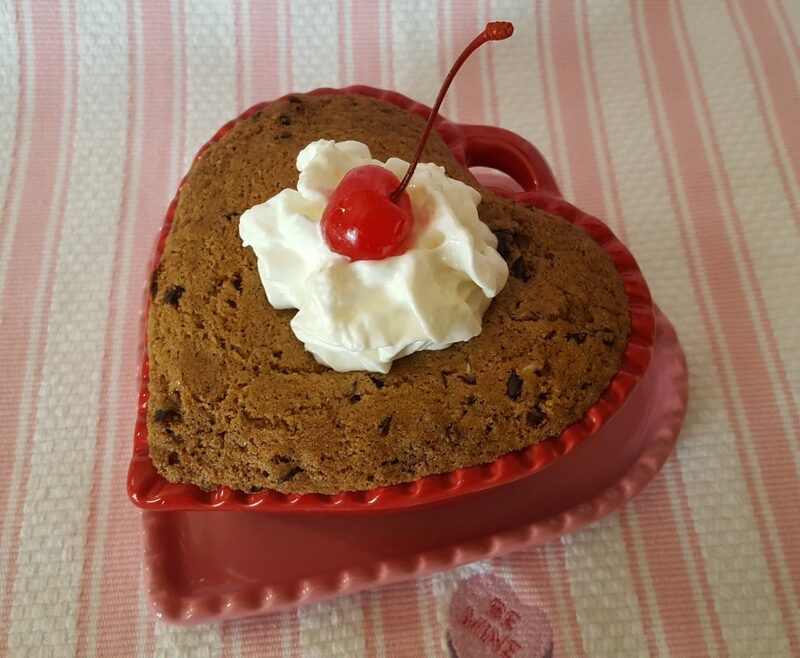 Share this heart-healthy dessert with your sweetie this holiday. Preheat the oven to 350 degrees. Spray two small ramekins (or a heart shaped larger one) with cooking spray and set aside. In a medium bowl cream together the coconut oil, sugar, and Splenda brown sugar blend. Mix well. Add in almond extract and egg and mix to incorporate. In a small bowl combine the salt, baking soda, and flour. Add the flour mixture to the cookie batter and mix until just combined. Fold in pecans, cherries, and cocoa nibs. Divide the batter between the two ramekins (or your special heart shaped dish). Bake for 15-20 minutes or until the edges and top are golden brown. *I used a small farm fresh egg (small because it’s cold and the hens were young). If using a medium or large egg, I would use just the egg yolk. If you wanted to take the heart-healthy theme further, you could use egg beaters. **The only whole wheat flour I use is Wheat Montana. It is finely milled and perfect to sub in for all-purpose flour. If you can’t find Wheat Montana (try Sprouts or Whole Foods), then use a whole wheat pastry flour. 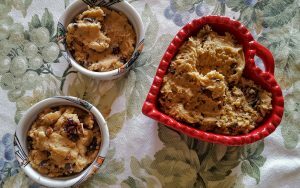 I swapped in coconut oil (for the butter), Splenda blend (for the brown sugar), cocoa nibs (for the chocolate chips) and added dried cherries and almond extract. Cooling (but not for too long—you definitely want to serve it warm). I made up the one batch from the original recipe and then a heart-shaped healthier one. I have to say that I honestly liked my version better. That is totally a biased opinion. 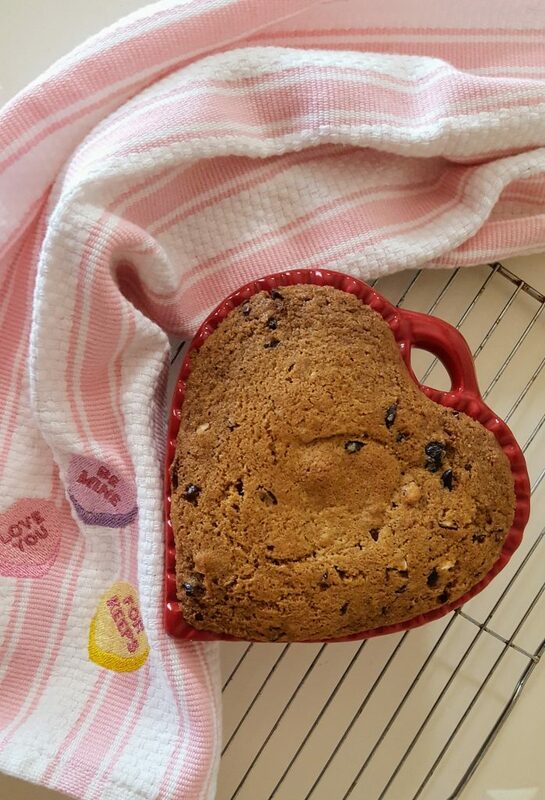 What are you making for your sweetie this Valentine’s Day? I’ve been trying to scale down my recipes, too—Bill doesn’t mind leftovers so aiming for 4 servings instead of 6 or 8. But when it comes to chocolate chip cookie, we have to have a full batch 🙂 I just try not to sample the dough or I’m a goner. 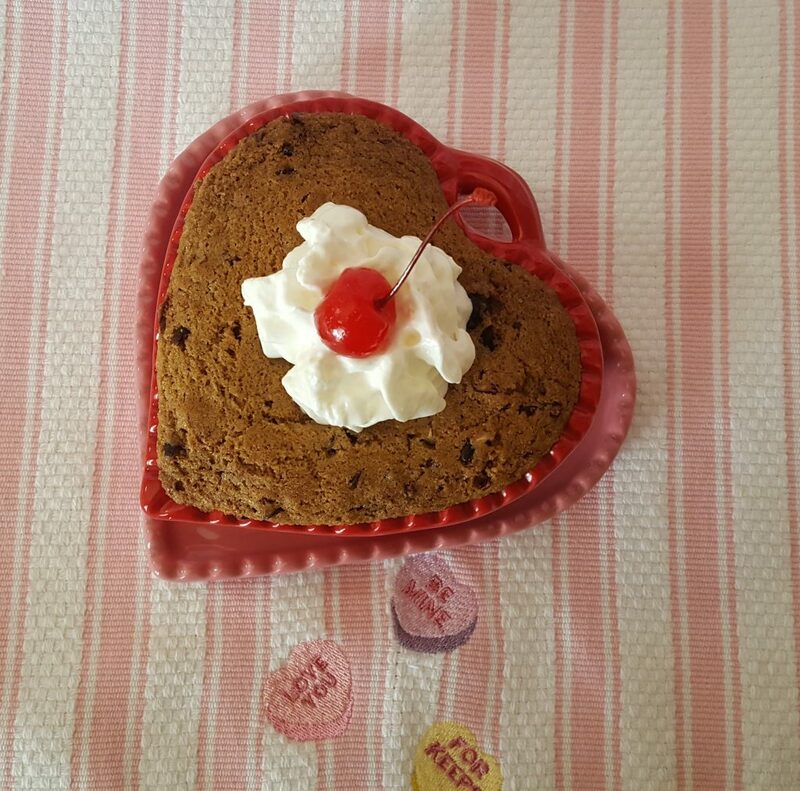 Love your Valentine’s Day cookie for two. Chocolate chip cookies are too good to scale down. I bake in batches of 4 to 6 cookies, and have found that the dough lasts at least a week in the refrigerator. Less tempting to eat one more and then one more and then … AND you always have warm, melty chocolate in your cookies. I’m not sure solid coconut shortening is necessarily heart healthy. Butter is probably better. There’s been new research. Thanks for the info. I really liked the cocoa nibs in this recipe. It worked out well. What a fun thing to do for Valentine’s. And love that it’s just for that one night and you don’t have a whole batch of cookies left to eat all week. Wait? Is that really a problem. 🙂 Happy Valentine’s Day! I love the healthier version of this sweet treat. Lucky me having all the ingredients and might just whip up a batch too. We really did like this version…better than the original inspiration.